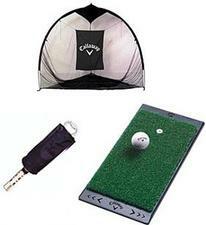 Train in the convenience of your home or yard with a Home Range Practice Bundle. The large 7' Zenith Hitting Net features a 4-point cross base and durable mesh material that stands up to the most intense practice. An FT Launch Zone Hitting Mat includes a rubber base and rubber tee holder to provide realistic conditions. The Pro Caddie shagger easily collects and dispenses 35 golf balls to outfit the Callaway® Home Range with superior quality. If you have any more questions about the Callaway Golf Home Range Practice Net - (Includes: 7 Foot Zenith Hitting Net, FT Launch Zone, Pro Caddie) ; do not see the model you are looking for; need custom options; or prefer to not purchase online, then please call us at (630) 656-1291.